Summer is upon us and B and I decided today to relax on the patio after a day of helping to pot some plants at the Cache Creek Nature Preserve. We went with a sangria of our own creation. What makes this one unique is that we us a traditional Mexican ingredient called agua de flor de Jamaica, a sweetened tea made from dried hibiscus flowers available at any Mexican grocery. Often drunk on its own ice and seltzer, it adds a sweet fruity and floral quality to the sangria. Add sugar and water and bring to boil. Add the hibiscus flowers. Boil for 1 minute. Remove from heat and steep for an additional 10 minutes. Strain and use 1 cup for the sangria. Zest the citrus with a vegetable peeler into long strips (so they don’t wind up in the drinks). Mix all but the seltzer in a large pitcher. Add a generous amount of ice and stir. Top up with seltzer. Serve in a festive wine or rocks glass with ice. Optionally, garnish with an orange or strawberry slice. We actually used the last couple of our Meyer lemons instead of the lime, which made the sangria a bit sweeter than usual, but still very nice. 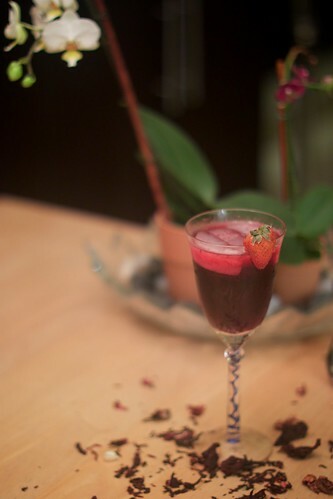 The fruity floral quality of the agua de flor de Jamaica makes this especially enjoyable on a warm summer evening.